Antimicrobial, antifungal and antiviral. 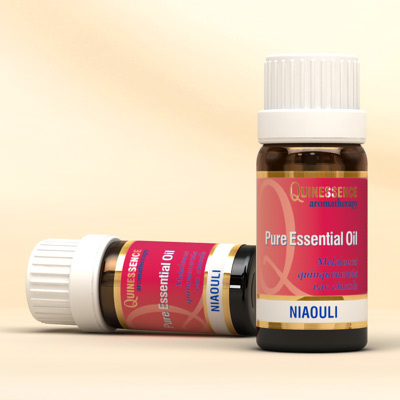 Closely related to tea tree, eucalyptus and cajuput, Niaouli Essential Oil has an impressive range of therapeutic properties that are indispensable to aromatherapists and home enthusiasts alike. It is an effective immunostimulant that increases the antibody and white blood cell count, making it ideal for boosting the immune system and as a recuperative oil. If you have sensitive skin, Niaouli Essential Oil is an ideal alternative to tea tree since it is very gentle (even undiluted) yet it’s still a highly effective antibacterial agent. Also, its aroma doesn’t dominate in blends like tea tree sometimes does. As a comparison; tea tree is probably the best all round antiseptic, whereas niaouli essential oil is more preferable when fighting bacterial and viral infections. Niaouli Essential Oil has a similar aroma to eucalyptus due to the high content of 1,8 Cineole, but it has unique characteristics of its own. It is sweeter and fuller than eucalyptus, with a faint trace of spiciness that makes it less medicinal. When vaporized or used on a tissue, a few drops of can be used to relieve blocked sinuses or ease a tickly cough, and can be gargled at the first signs of a cold or sore throat to help prevent infection. 1,8 Cineole, a & b - Pinene, a - Terpineol, Limonene, b - Caryophyllene, g – Terpinene, Nerolidol, Myrcene, Viridiflorene, p – Cymene, allo-Aromadendrene, Linalool, a – Phellandrene.